Autumn - Bamboo Chenille Scarf - Space-Dyed 8" x 68"
A one-time price of $45.00 will be added to your order. Our scarves are gorgeous, comfortable, of the highest quality, and affordable. They drape beautifully. 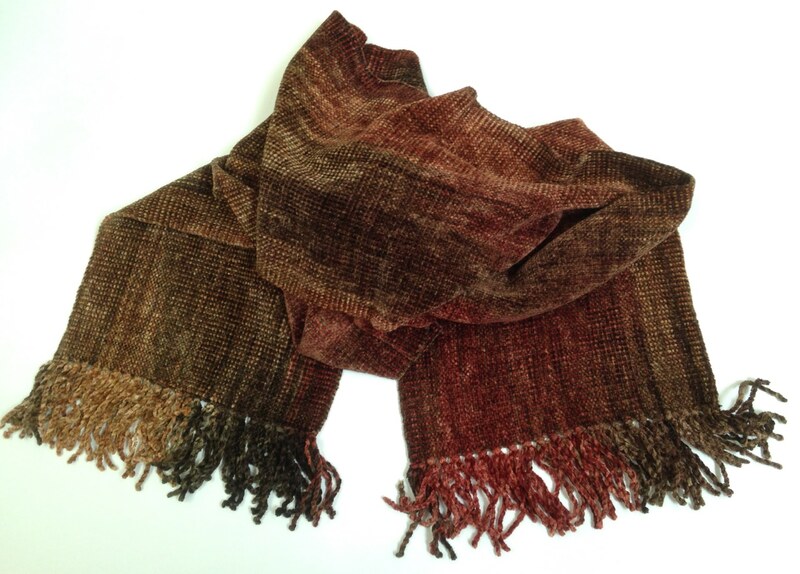 Suitable for wearing as an outdoor winter scarf or indoor ornamental scarf. They are colorfast and the chenille will not rub off onto your clothing. The process of making a scarf is labor intensive. The 100% bamboo chenille is wound into skeins on a hand-powered machine, then hand-dyed with dyes imported from the US. The yarn is then warped onto a warping board. The scarf is then handwoven on a traditional backstrap loom, a process which often takes a full day of work. The chenille is made from sustainably-grown organic bamboo thread in China. Hand wash in cold water with mild soap such as hair or baby shampoo, lay flat until almost dry, then “fluff up” briefly (three minutes) with a fabric softener sheet in a dryer set on low-heat gentle. Always use fabric softener and minimize agitation and heat. Agitation will eventually remove the pile from the chenille and the tassels, and tangle the tassels. Heat could shrink your item. For creases or a too-worn look, freshen up by spritzing with water and drying as above. Or hang in a steamy bathroom. The fabric has already been washed by hand and dried as above, in Guatemala. Or you may professionally dry clean your scarf. Add a review for Autumn - Bamboo Chenille Scarf - Space-Dyed 8" x 68"